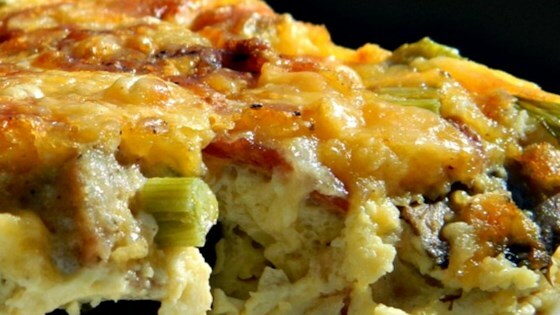 "The best breakfast casserole I've ever made. I combine a few different recipes and this is my picky hubby's most favorite!" Preheat oven to 400 degrees F (200 degrees C). Spray a 9x13-inch baking dish with cooking spray. Arrange bacon slices in a single layer on a baking sheet. Bake in the preheated oven until browned and crisp, 20 to 25 minutes. Drain bacon slices on paper towels and transfer 1 to 2 tablespoons bacon grease to a skillet, reserving the remaining bacon grease. Add butter to skillet. Cook and stir potatoes in the hot bacon grease-butter until lightly browned, about 10 minutes; season with salt and black pepper. Transfer potatoes to the prepared baking dish. Heat about 1 tablespoon reserved bacon grease in the skillet over medium heat; cook and stir mushrooms until softened, 5 to 10 minutes. Layer mushrooms over potatoes. Place green onions in the same skillet and remove from heat. Allow green onions to soften from the residual heat in skillet; layer over mushrooms. Crumble bacon over green onion layer; top with 1 cup Cheddar cheese. Blend eggs, milk, and 1 teaspoon salt in a blender until smooth; pour over Cheddar cheese layer. Top casserole with remaining 1 cup Cheddar cheese. Bake in the preheated oven until casserole is set and a knife inserted in the middle comes out clean, 30 to 40 minutes. You can use Eggbeaters® or already cooked bacon. Any variety of cheese can be substituted for the Cheddar cheese. Did anybody else wonder where the celery in the photo comes into the recipe? Or do people just submit random photos to accompany their recipe. What appears to be celery is the green onion. Easy recipe.